The Board of Control for Cricket in India (BCCI) today admitted in the Supreme Court that Jagmohan Dalmiya was at present a “de jure” President of the board despite Ranbir Singh Mahendra being elected to the post as the annual general meeting (AGM) has not ratified it. The picturesque M. A. Aziz Stadium, venue of the Indo-Bangladesh Test, and Hotel Agrabad, where the teams are staying, are under unprecedented security cover for the second and final Test beginning here on Friday. Sachin Tendulkar returned to the top 10 in the latest Test batting ratings after his world record-equalling 34th century while Rahul Dravid continued to lead the charts. Pakistan and Australia are poised for an explosive bowling duel in the first cricket Test starting here tomorrow, with both teams declaring they have the artillery to bombard the other into submission. Former Test spinner Venkatapathi Raju, who is leading the Hyderabad Ranji team in the ongoing match against Uttar Pradesh, today announced his retirement from first class cricket. Bangalore: Former South African cricketer Jonty Rhodes has declined an offer by the National Cricket Academy (NCA) here to be its fielding consultant, citing personal reasons. Continuing their winning spree, Himachal Pradesh defeated, Kammu and Kashmir by an innings and 129 runs on the third day of their Ranji tie here today, registering their third victory in a row. Needing an outright win to maintain the second position in the points table for a place in the semi-finals, Tamil Nadu staged a splendid comeback to dismiss Punjab for 218 and scored 190 for three in their second innings at stumps on the third day of the Elite Group-B Ranji Trophy cricket championship match here today. Thanks to the disciplined show by their bowlers, hosts Delhi eye a first innings lead against Karnataka after restricting the visitors to 273 for eight on the penultimate day of their Ranji Trophy Elite group A match at Jamia Millia ground here today. Piloted by a fighting knock from opener Faiz Fazal (77 not out), Vidarbha were pressing for an outright win over Haryana on the third-day of the Plate 'B' Ranji Trophy cricket match at the VCA Stadium here today. Jyoti Randhawa says his title triumph in the Volvo Masters Asia Golf Tournament in Kuala Lumpur last week was no flash in the pan. He says he has worked hard for his success, after many a heart break. He asserts that the Indian golfers have the talent, but falls short in technique. “You have to master the technique to compete on even terms at the international level”, he said. “But 98 per cent of the Indian golfers don’t do that. They mostly spent their time on the greens”, he observed. But he was happy that Indian golf was looking up. “Five years back, nothing much was heard about Indian golf”, he said while launching a new set of golf clubs of Mizuno, the Japanese product whose brand ambassador Jyoti is. Leander Paes has been given a wild card entry in the singles event of the Chennai Open ATP Tennis Championship to be held in Chennai in January next year. He has also confirmed his participation in the doubles, partnering Nenad Zimonjic from Serbia. Punjab stormed into the finals in volleyball in the 30th National Sports Festival for Women which entered third day today. Punjab also qualified for semifinals in kho-kho and kabaddi. Bengal Mumbai Football Club (BMFC), Mumbai defeated City College Old Boys, Hyderabad 5-1 to qualify for the semi-final of the All-India Lal Bahadur Shastri Memorial Football Tournament at the Ambedkar Stadium here today. The eighth edition of the All-India Ramesh Chander Memorial Hockey Tournament will be organised at Burlton Park hockey stadium here from December 17 to 24. The participating teams are Punjab and Sind Bank, Punjab Police, BSF, Indian Airlines, Malaysian XI and Canada XI in men’s section and Sukhjit Starch Mills, Pepsu XI, Shahbad XI and Uttaranchal XI in women’s section. Ace Indian duo Saurav Ghosal and Ritwik Bhattacharya authored a major upset on their way to the semifinals of the second World Doubles Squash Championship at the India Cements Squash Academy here today. Sisters Ankita and Sanaa Bhambri played some superb tennis on their way to the quarterfinals of the Le Meridien ITF tennis tournament at the NTA courts in Gurgaon, near here today. Navpreet Kaur, of the Government College for Girls (GCG), won the high jump event at the Punjabi University Inter-College Athletics Meet which commenced at the Raja Bhalindera Singh stadium here today. Making a strong plea before a Bench of Mr Justice N. Santosh Hegde and Mr Justice S.B. Sinha for an interim order for conclusion of the AGM, restrained by a Chennai civil court, in view of the controversy over the September 29 election of Mahendra, board’s counsel said Dalmiya was ready to relinquish his post as President tomorrow if an interim direction was issued. BCCI counsel A.M. Singhvi said the AGM convened in Kolkata on September 29 and 30 could not be concluded because of the Chennai court order and in absence of it, no effect could be given to the election of new President and office-bearers under rules unless the AGM was concluded. When the Bench asked, “You mean to say that Dalmiya is a de jure President of the BCCI, not Ranbir Singh Mahendra,” Singhvi said, “That is correct”. The Bench, however, told the BCCI counsel that election of the board should not be under a cloud and should be “acceptable to the public” in view of the board attaining so much importance with the popularity of cricket. “We have to take a holistic view if we are satisfied that a particular person was prevented from voting and another person was permitted to vote. The BCCI has to prove that everything was fair in the election,” the Bench observed, apparently referring to the controversies about D.C. Agashe from Maharashtra not being allowed to vote and the fights of Delhi District Cricket Association and Rajasthan Cricket Association allegedly being “ignored” when AGM had elected Mahendra as President by the casting vote of Dalmiya. Dalmiya’s counsel Sidhartha Shankar Ray, while defending his being made Patron-in-Chief of the BCCI for two years, alleged that the entire litigation on the election issue had been launched on behalf of certain “green-eyed monsters” who were bent upon “destabilising” the functioning of the board, which was made financially so strong by the outgoing President. The design behind filing of the suit in the Madras High Court could be proved from the fact that the plaint was signed by a Delhi-based lawyer on power of attorney from Chennai’s Netaji Cricket Club secretary, he said. “It was unheard of a counsel filing the suit on power of attorney. How could such a lawyer be aware of the actual facts of the case,” Ray asked, while citing the performance of Dalmiya either as BCCI chief and ICC President, when both these bodies had become financially so strong. “When Dalmiya was elected ICC President in 1997, its bank account had only £ 16,000 as balance money, but when he relinquished his post after three years in 2000, the cricket body was rich by £ 14 million. This itself is the testimony of the managerial skills of the man,” Ray said, adding similarly, the BCCI was today one of the richest cricket bodies in the world. Agashe’s counsel Fali S. Nariman got little time today to put forth his arguments at the fag end of the day. The BCCI challenged the high court order, restraining Mahendra and newly elected office-bearers of the baord from taking charge, on the ground that the verdict was given by a division Bench on a review petition, which was unheard of. A radical Islamic group’s death threat to the Indian cricketers has forced the hosts to take tight security measures. The Bangladesh Cricket Board has asked the spectators not to carry fruits, water bottles, firecrackers, bamboo sticks, iron rods, matchboxes or any kind of fuel or explosives to the ground. The local police has also made elaborate arrangements for smooth holding of the Test and the first one-dayer. A four-member Indian security team visited the stadium and the hotel on December 8 and gave the necessary security clearance for the matches. Local sources said about 1,000 security personnel, mostly in riot gear, and other law-enforcing agencies had been deployed. They said at least eight close-circuit televisions had been installed in the pavilion and the dressing rooms and security control rooms opened in the stadium and the hotel. A coordination meeting among the organisers, the police and the administration was held here yesterday, headed by the District Magistrate and Chittagong Cricket Association president Dr S.N. Ahmed Rumi to review the situation. The authorities have banned the general public from entering the stadium complex and restricted the movement of vehicles. They have also closed the road in front of the hotel for vehicular traffic. The Chittagong Krira Sangstha had to shift the ticket-selling counters adjoining the pavilion to premises outside the stadium. ‘’The security here is even more stricter that what it was in Dhaka,’’ a spokesman of the sangstha said. Meanwhile, the authorities are giving final touches to the stadium and the ground. Pitch curator Badiul Alam Khokon inspected the wicket, which had some grass. Both teams arrived here amid tightest-ever security. Even mediapersons were barred from speaking to the two teams. After their victory in the first Test, India now only need a draw to improve their International Cricket Council ratings from third to second, behind leaders Australia. The team management can make a few changes in the line-up and give uncapped players a nod. ‘’There are a couple of youngsters in the team and we are thinking to give them an opportunity in the second Test and one-dayers,’’ Ganguly said. On the other hand, Bangladesh have lost 30 matches, 16 of those by an innings, of the 33 Test matches they have played so far, triggering a strong debate whether they should continue to have the status of a Test-playing nation. Sachin Tendulkar returned to the top 10 in the latest Test batting ratings after his world record-equalling 34th century while Rahul Dravid continued to lead the charts. Tendulkar made a huge leap to number six from his previous 12th after he scored his career-best 248 in the first Test against Bangladesh in Dhaka last week, according to the official ratings released by PricewaterhouseCoopers. Virender Sehwag slipped two places to number four, giving his place back to Brian Lara, while Jacques Kallis found place among top three batsmen after his good show in the recent Test series against India. Matthew Hayden of Australia was placed fifth, but his skipper Ricky Ponting, upstaged by Tendulkar, was now seventh in the table. Pakistan’s Inzamam-ul-Haq, Australian Damien Martyn and Sri Lanka’s Kumara Sangakkara slipped by one position each to be on eighth, ninth and tenth position, respectively. South Africa’s Herschelle Gibbs went out of the top 10. Pakistan will go all out to attack Australia’s batting, using four specialist bowlers, spearheaded by the world’s fastest in Shoaib Akhtar, on a lively wicket at the Western Australian Cricket Association ground. Although Pakistan’s starting line-up will not be confirmed until tomorrow morning, captain Inzamam-ul-Haq said three pace bowlers would be used, with leg-spinner Danish Kaneria. Express bowlers Akhtar and Mohammad Sami would open, with either left-arm quickie Mohammad Khalil or medium-pacer Rana Naved-ul-Hasan to start in support. “I think we will go with four specialist bowlers,” captain Inzamam-ul-Haq confirmed today, on the eve of the first match in the three-Test series. But the skipper refused to be drawn on whether both all-rounders Abdul Razzaq, a medium-pacer, and offspinner Shoaib Malik, under a cloud because of a suspect bowling action, would be used. “We will know the side tomorrow morning,” he said. Australia is in a similar position, with captain Ricky Ponting saying paceman Brett Lee was still a strong chance to be included in the starting line-up, despite earlier suggestions that he would be the 12th man. He said hot weather in Perth on Tuesday and Wednesday could have affected the wicket and would possibly influence the selectors’ final choice. “It will be nice if we can have that showdown that everyone is looking for I guess — the Pakistani fast bowlers against all of our fast bowlers, and how each batting side is going to react to that,” he said. Ponting said Akhtar was unquestionably the fastest bowler he had ever faced, but it would be a mistake for Australia to put too much focus on him. “We are very aware of Pakistan’s strengths and weaknesses,” he said. “Mohammad Sami is the other one we cannot forget about. He is a very good new ball bowler. He is as quick as Shoaib and he will make it very difficult for us to bat against him as well,” he said. “We as players certainly have not focused that much on Shoaib at all,” Ponting said. “We know what he is capable of. We know what he can do. Quite often, when you have a guy like that in your side, it can be the other guys who sneak under your guard a little bit and we do not want that to happen,” he said. Both captains remained adamant that spinners would be included in their starting side. Australia’s Shane Warne has a remarkable record against Pakistan, taking 76 wickets in 12 Tests at an average of 18.60, although the pace-friendly WACA is his least successful venue anywhere in Australia. But Ponting said it would not be feasible to leave him out of the side and if Australia opted to start with four pace bowlers, they would omit a batsman instead. “Shane Warne’s record against Pakistan is unbelievable,” Ponting said. “Although his average here is slightly higher than it is on most other grounds or anywhere around the world, I think he will still play a big part here because I think their batsmen will be a bit worried about our pace attack and they will probably take a few more risks against Shane,” he said. “As we have seen in the past, when batsmen try and do that, he generally gets the better of them,” he said. Ponting said in the past, Australia had both blasted Pakistan out and bided their time waiting for them to make mistakes, with both methods proving successful. “I think we have had a bit of success going both ways against Pakistan,” he said. Sagi Lakshmi Venkatapathi Raju, who made his Test debut against New Zealand in 1989-90, played 53 Tests and took 93 wickets with 6 for 12 being his best. 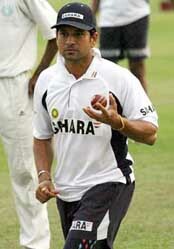 Raju, nicknamed ‘Muscles’, claimed 63 wickets in the shorter version with 4 for 46 being his best during his six year international cricketing career. Also called “Lachchi” by his close friends, Raju is only the second player after Kanwaljit Singh to play 100 first class matches for Hyderabad. Bangalore: Former South African cricketer Jonty Rhodes has declined an offer by the National Cricket Academy (NCA) here to be its fielding consultant, citing personal reasons. Durban-based Rhodes, regarded as one of the greatest exponents of fielding, had been sounded by the NCA to take up a two-week coaching assignment to pass on fielding tips to the trainees, but the cricketer conveyed his unwillingness. NCA sources quoted Rhodes, who last played his international match in February 2003, as saying he had just started working for a bank in South Africa and was not in a position to spend a fortnight at a stretch in India. The hosts got four points and one bonus point for inflicting an innings defeat from the match and were on top in Plate "a" group with 16 points. They would play their last match of the group against Jharkhand at Jamshedpur from December 22. Requiring 277 runs to avoid an innings defeat, Jammu and Kashmir were bowled out for 158 runs in the second innings, with Ashwani Gupta remaining not out on 43. Resuming the play at the overnight score of 58 for one, the visitors lost the second wicket at 72 when Jagtar Singh was out for four. Fayaz Ahmed, who was not out on 24, added seven runs to carry his score to 31. Vishal Bhatia took four wickets for 40 runs while Vikram Malick and Kuldeep Diwan took three wickets each for 55 and 30 runs, respectively, to wind up the second innings of the visitors at 158. Himachal Pradesh had defeated orissa by an innings in the last match and humbled Saurashtra in an earlier match. Jammu and Kashmir (second innings): S Sajjad c Sandeep Sharma b Vishal Bhatia 32, Fayaz Ahmed c Sandeep Sharma b Vikram Malick 31, Jagtar Singh c Manvinder Bisla b Vishal Bhatia 4, Kanwaljit Singh c Ankur Bassi b Vikram Malick 0, Mazid Dar b Kuldeep Diwan 7, Ashwani Gupta not out 43, Dhruv Mahajan b Vishal Bhatia 3, Hardeep Singh b Vikram Malick 12, Arshad Bhat c Sub b Vishal Bhatia 1, Abid Nabi lbw Kuldeep Diwan 3, Samiullah lbw Kuldeep Diwan 1. Fall of wickets: 1-58, 2-72, 3-83, 4-89, 5-93, 6-115, 7-120, 8-130, 9-133, 10-158. With an unbroken 71-run stand for the fourth wicket, S. Badrinath batting on 43(170 mnts, 141 balls, five fours) and southpaw S. Sharath batting on 28( 67 mnts,63 balls, four fours) helped Tamil Nadu to a good position with an overall lead of 216 runs, with the final day’s play remaining. The Tamil Nadu opener and the left-hander Vidyut Sivaramakrishnan, who laid a solid foundation, missed his century by just one run in 223 minutes and 168 balls, studded with ten fours. Dame luck smiled on the home team as Punjab resumed their first innings at the overnight score of 164 for 5, in reply to Tamil Nadu’s first innings score of 244. Tamil Nadu’s debutant medium pacer, Jesuraj, who struck some quick blows to trigger a Punjab slump picking up three key wickets yesterday including that of Yuraj Singh, struck even more venomously to end up with a haul of 7 for 76 off 28 overs. He became the fourth Tamil Nadu bowler after Y. Ramachandran (7-109), Vikram Thambuswamy (8-37), both medium-pacers and leg spinner L. Sivaramakrishnan (7-28), to pick up seven or more wickets on debut. Ricky b Ramkumar 71, Sodhi c Vikram b Jesuraj 24, Yuvraj c Vikram b Jesuraj 9, Mongia b Jesuraj 1, Dharmani c Vikram b Ramkumar 23, Kakkar not out 29, Uniyal c Vikram b Jesuraj 17, Sawal c Vikram b Jesuraj 1, Navdeep b Jesuraj 0, Rajesh lbw b Jesuraj 1, VRV Singh c Sharath b Vidyuth 28. Total (all out in 80.4 overs) 218. Fall of wkts: 1/46, 2/60, 3/63, 4/137, 5/147, 6/174, 7/180, 8/182, 9/186. Bowling: M.R. Srinivas 13-3-31-0, R. Jesuraj 28-9-76-7, R. Ramkumar 28-10-52-2, Arjun Sarathy 7-1-36-0, Vidyuth 4.4-0-20-1. In reply to Delhi’s first innings total of 427 for seven declared, Karnataka still trail by 154 runs with two wickets in hand. Resuming from their overnight score of 30 for no loss, Karnataka was dealt the first blow when Barrington Rowland(25) was caught by Mithun Manhas off Chetanya Nanda. Joined by Skipper Sujith Somsunder(18), overnight opener Ayudda Utthappa(88) then got into the steadying act but host spinner Rahul Sanghvi threw the spanner claiming Somsunder who gave Manhas his second catch of the match. Utthappa tried to stitch together a partnership with VST Naidu(13) but Sarandeep Singh claimed the latter to thwart the move. Nanda then earned the vital wicket of Utthappa to deny the visitors any chance of coming closer the Delhi target and the opener perished caught by Aakash Chopra to after playing a lone hand. His 88-run innings off 210 balls included eight hits to the fence. Delhi bowlers never allowed rival batsmen settle in the middle and wickets fell at regular intervals. Sudhindra Shinde(52) tried to arrest the slide and played an enterprising 89-ball knock that included five boundaries. Chasing 328 for victory, the hosts were 160 for three at close, still needing 168 runs with seven wickets in hand. Earlier, Haryana, overnight 208 for eight, added 22 more runs before being all out for 230 off 85.1 overs. Paceman Baburao Yadav emerged as the most successful bowler claiming 3 for 34. Vidarbha started with a cautious approach. Amit Deshpande (35) and Faiz Fazal put on 69 for the opening wicket before Amit departed. Alind Naidu (10) and Ranjit Paradkar (24) both fell as Faiz held the innings together for the home side. Jyoti Randhawa says his title triumph in the Volvo Masters Asia Golf Tournament in Kuala Lumpur last week was no flash in the pan. He says he has worked hard for his success, after many a heart break. He asserts that the Indian golfers have the talent, but falls short in technique. “You have to master the technique to compete on even terms at the international level”, he said. “But 98 per cent of the Indian golfers don’t do that. They mostly spent their time on the greens”, he observed. But he was happy that Indian golf was looking up. “Five years back, nothing much was heard about Indian golf”, he said while launching a new set of golf clubs of Mizuno, the Japanese product whose brand ambassador Jyoti is. 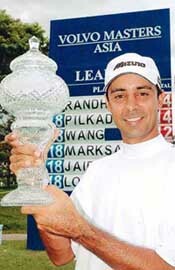 Jyoti disclosed that he would compete in 18 to 20 events in Japan and a few events in the European Tour and two in the US in 2005. “I would like to compete with the best in the world”, he said. He said the courses in Japan were very tough “but the Asian courses are more forgiving”. “It’s tougher to finish among the top ten in Japan”, he felt. Jyoti admits that his game requires a lot more consistency to compete on an even keel in high-pressure competitions like the US Open. 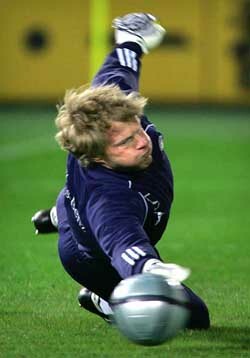 “I have the game, but will have to work hard to maintain the same level of consistency in competitions”, he points out. Jyoti said he has had a good season this year “as I had a few top tens and made a lot of impact on the European Tour. Most importantly, I ended the year winning a title, that was lacking the whole season”. He said his progress could be gauged from his takings in the prize money stakes. “My income shows my progress on the tour (Jyoti earned $ 351709 to finish second behind Thongchai Jaidee of Thailand)”, he said with a twinkle in his eyes. Talking about his round of 67 in the final, which forced a play-off with Australian Terry Pilkadaris before wresting the trophy, Jyoti said: “Those kind of rounds you cannot explain. It just falls in place. But I played my hats off”. The Volvo title winner said it has been a “great learning experience to be associated with Vijay Singh, as that kind of knowledge and wisdom is not seen in India”. “He is the pioneer of the PGA (Professional Golfers’ Association) Tour, and we consider him as an ex-Indian and not as a Fijian”, Jyoti noted. Leander has competed in the Chennai Open since its inception, winning the doubles title, partnering Mahesh Bhupathi, on four occasions from 1997 to 2002. Leander has claimed four doubles titles this season, and had made the finals of the Australian Open mixed doubles with Martina Navratilova and the US Open men’s doubles with David Rikl. Leander will be partnering Nenad Zimonjic in doubles in 2005. The Serbian has won a doubles title and a singles title to be presently ranked 18th in the ATP doubles ranking. Punjab defeated West Bengal 25-13, 25-13, 25-16 in the first semifinal in volleyball. The match lasted about 30 minutes. Punjab girls dominated the proceedings from the beginning and maintained the pressure thought out. West Bengal players tried their best to put some fight, but they were unable to control the powerful smashes of Punjab players. Punjab will face UP in the finals, who defeated Tamil Nadu in second semi-final in four games 22-25, 25-17, 25-17, 25-17. Both the teams were evenly matched and gave very good performance. In kabaddi, Punjab, Karnataka, Maharashtra and Andhra Pradesh qualified for semi-finals, Punjab also booked semifinal berth in kho-kho. Other teams to qualify are Maharashtra, Karnataka and West Bengal. Kabaddi: Punjab beat Chattisgarh 59-6 Kerala beat Goa, 28-11, Gujarat beat Jharkhand, 20-9, Haryana beat Tamil Nadu, 58-23, Manipur beat MP., 23-7, Karnataka beat Delhi, 19-12, Bihar beat Tripura, 39-16, Himachal beat Tamil Nadu, 42-12, Orissa beat Manipur, 19-17, UP. beat MP., 24-15. Volleyball: Bihar beat J&K 25-17, 25-12, Orissa beat Jharkhand, 25-9, 25-8, W. Bengal beat Tripura, 25-18, 25-7, HP. beat Goa, 25-14, 25-15, W. Bengal beat J&K 25-10, 25-8, Gujrat beat AP., 25-19, 25-10, UP. beat Jharkhand, 25-07, 25-09, MP. beat Chattisgarh, 25-13, 25-05, Tamil Nadu beat Chattisgarh, 28-05, 25-06, Tripura beat Bihar, 25-14, 25-23, Punjab beat AP., 25-06, 25-08, Orissa beat Haryana, 25-22, 17-25, 25-15, Chattisgarh beat HP., 25-21, 23-25, 25-16. UP. beat Tamil Nadu 25-22, 25-17, 25-17, 25-17. In another match, South East Central Railway (SECR), Bilaspur defeated District Football Association, Varanasi 2-1 to record their first victory. The semi-final slot from this group will be decided after the match between Titanium, Kerala and Mohammedan Sporting, Kolkatta tomorrow. The BMFC, down by a goal scored by Maozam for the Hyderabad club in the 26th minute, mauled the rival goal in the second half to end up with a big victory. Innocent equalised in the 35th minute and also scored the third and fifth goals. In between, Swamy and Kennedy found the target to bulge the tally of the Mumbai club. The SECR, who had lost their earlier two matches, forged ahead in the 15th minute when Ayaz Ahmad chased a through ball to slot home. Abdul Khalique scored the second goal in the 75th minute while Karan Singh reduced the margin for Varanasi due to the lapse of the rival custodian. In boys (under-14) section, Escorts Ramesh Chander Academy, Jalandhar, Surjit Academy, Ropar Hawks and Ramesh Chander Academy, Amritsar, will clash. Winners in men’s section will get a cash award of Rs 1 lakh along with the trophy while runners-up will get Rs 50,000. While second seed Ankita was tested by Parul Goswami, Sanaa had no such problems as she coasted to a win against Chirashanti Rajur. Earlier, the three-day championship was inaugurated by the Vice-Chancellor Dr S.S. Boparai. Results: High jump: Navpreet Kaur (GCG, Patiala)-1, Gurjit Kaur (Jawaharlal Nehru College for Women, Gobindgarh)-2, Sukhjinder Kaur (University campus)-3. 20 km walk: Baljinder Singh (Government College, Dera Bassi)-1, Lakhwinder Singh (Ranbir college, Sangrur)-2, Balwan Singh (Mohindera College, Patiala)-3. 800m: Jagdeep Singh (Khalsa College, Patiala)-1, Sukhpal Singh (Government College, Mastuana Sahib)-2, Sukhjinder Singh (Mata Gujri College, Fatehgarh Sahib)-3. 5 km walk: Sandeep Kaur (Khalsa College, Morinda)-1, Harpuneet Kaur (Khalsa College, Morinda)-2, Manjeet Kaur (University campus)-3. Javelin throw: Tejinder Singh (University campus)-1, Surinder Singh (Khalsa College, Patiala)-2, Gurdas Singh (National College, Mansa)-3.